Fertility rates refer to the rates of birth per 1,000 women of reproductive age in a given population. When the fertility rate is at the replacement level, a population will remain stable, neither growing nor shrinking. However, when the fertility rate deviates from the replacement level, the size of the population will change. Fertility rates above the replacement level will cause the population to grow; fertility rates below the replacement level will cause the population to shrink. The population reached 6 billion people around 1999, and increased to around 7 billion by 2012. However, in some countries the birth rate is falling while the death rate is not, leading to a decline in the population growth rate. The population growth rate has been decreasing in higher income countries; however the number of people added to the global population each year continues to increase due to increasing growth rates in lower income countries. High fertility rates lead to population growth, which, under certain circumstances, can cause a condition known as “overpopulation. ” Overpopulation is not a function of the number or density of individuals, but rather the number of individuals compared to the resources they need to survive. In other words, it is a ratio: population to resources. Humans are not unique in their capacity for overpopulation; in general terms, overpopulation indicates a scenario in which the population of a living species exceeds the carrying capacity of its ecological niche. When estimating whether an area is overpopulated, resources to be taken into account include clean water, food, shelter, arable land, and various social services (such as jobs, money, education, fuel, electricity, medicine, proper sewage and garbage management, and transportation). Overpopulation can have deleterious effects. When population outstrips available resources, calamity can result, including famine, shortages of energy sources and other natural resources, rapid and uncontrolled spread of communicable diseases in dense populations, and war over scarce resources, such as land. Dense populations may also settle available land and crowd out other land uses, such as agriculture. Presently, every year the world’s human population grows by approximately 80 million. However, that population growth is not distributed evenly across all countries. Most population growth comes from developing countries, where birthrates remain high. Meanwhile, about half the world lives in nations with sub-replacement fertility. In some of these countries, the population has actually begun to shrink (e.g., Russia). All of the nations of East Asia – with the exceptions of Mongolia, the Philippines, and Laos – have fertility rates below replacement level. Russia and Eastern Europe are dramatically below replacement fertility. Western Europe also is below replacement. In the Middle East Iran, Tunisia, Algeria, Turkey, and Lebanon are below replacement. Some countries still have growing populations due to high rates of immigration, but have native fertility rates below replacement: Canada, Australia, and New Zealand are similar to Western Europe, while the United States is just barely below replacement with about 2.0 births per woman. 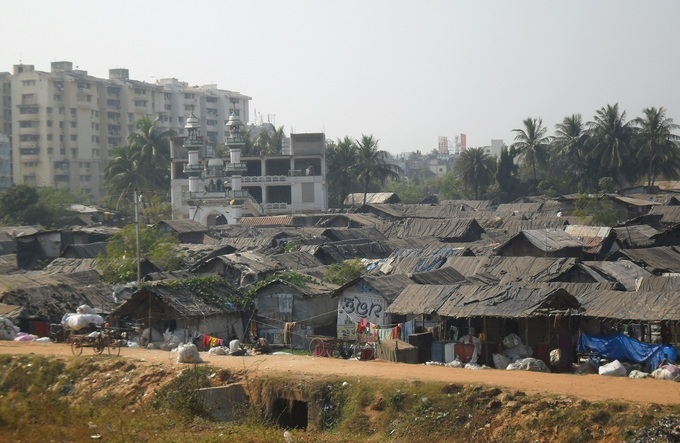 Slums in Mumbai: Rapid population growth in Indian cities has resulted in vast slums as populations have exceeded available land and housing. A new fear for many governments, particularly those in countries with very low fertility rates, is that a declining population will lead to underpopulation and will reduce the gross domestic product (GDP) and economic growth of the country, as population growth is often a driving force of economic expansion. To combat extremely low fertility rates, some of these governments have introduced pro-family policies that include incentives, such as payments to parents for having children and extensive parental leave for parents. When the fertility rate is at the replacement level, a population will remain stable, neither growing nor shrinking. Fertility rates above the replacement level will cause the population to grow; fertility rates below the replacement level will cause the population to shrink. Overpopulation is judged relative to carrying capacity and can have deleterious effects. When the population is too large for the available resources, famine, energy shortages, war, and disease can result. Recently, in some countries, sub-replacement fertility rates have led to underpopulation. This can lead to economic decline, the aging of the population, and poverty. fertility rate: The average number of children that would be born to a woman over her lifetime if she followed the current average pattern of fertility among a given group of women and survived through her reproductive years; used as an indicator of strength of population growth. Replacement level: Regarding fertility, refers to the number of children that a woman must have in order to replace the existing population. gross domestic product: (GDP) The market value of all officially recognized final goods and services produced within a country in a year; often used as an indicator of a country’s material standard of living. carrying capacity: The number of individuals of a particular species that an environment can support.